Jenn-Air and Bosch have a new slide-in range. They both use a hybrid type design which in fact is part slide-in range part and part freestanding range. We will explain the differences of freestanding vs. slide-in vs. this new hybrid range as well as both companies and then both products. This is your average freestanding range. 90% of the homes have this type of range. It works well, but the backguard interrupts the backsplash. It is a minor detail, but is noticeable in a nicer remodel. The range overlaps the sides and rear of the countertop for an integrated look. It exposes the backsplash and prevents spills and crumbs from dripping between the range and cabinets. As you can see, the left and right sides will be perfectly flush with your countertops because the sides of the range are flat. 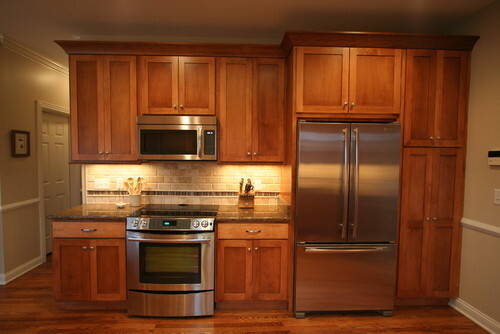 Often times, you would have to notch or cut the counters to accommodate the range. Then you would have to either install a piece of counter or filler strip behind the range to complete the installation. Typically, people did not choose a slide-in for replacement, because it required these extra steps. Many companies have started to produced a freestanding range with the controls on the front. You can now replace your existing range and have the look of a slide-in without the installation issues. There still will be a seam for spills to drip between the cabinet and countertop. Many companies like GE Cafe, Electrolux, Jenn-Air and Bosch are actively manufacturing this hybrid model. Bosch is a German company, but manufactures their products in the U.S. 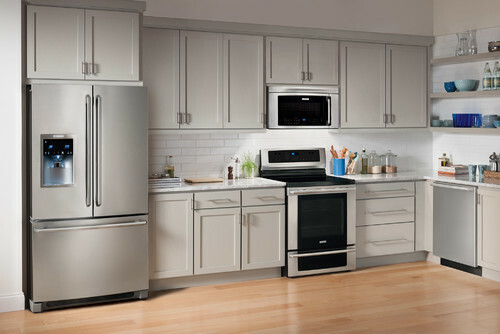 They are known for quiet dishwashers, but Bosch has introduced some competitive, upscale cooking products under the Bosch, Bosch Benchmark and Thermador brands. 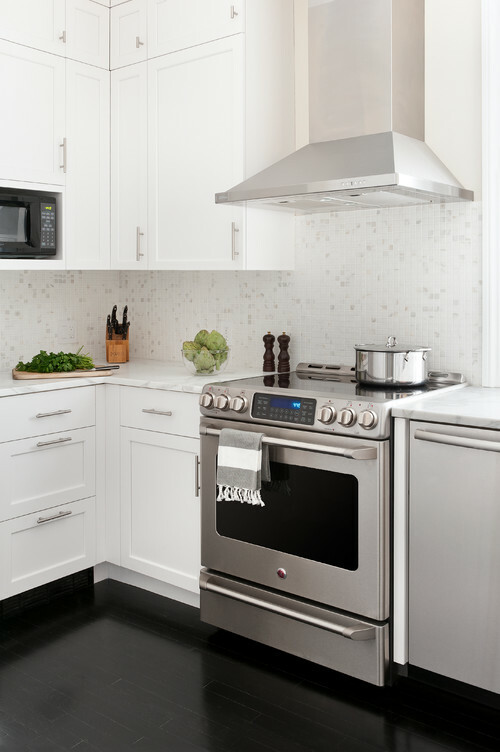 Jenn-Air is a subsidiary and the high end name of the Whirlpool company. In 2007, they invested 300 million dollars in Jenn-Air, specifically in cooking. 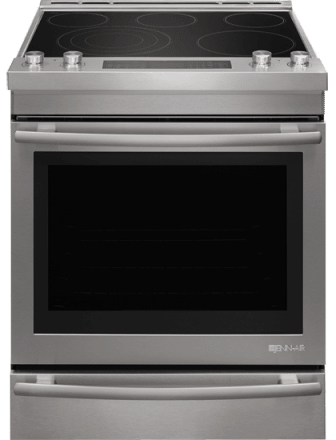 They have redesigned their professional range, the wall oven and now finally their slide-in range. Both ranges will install flat up against the wall without needing additional countertop or filler strips. If we take a look at the chart above, you can see the Bosch still has the “classic” overlapping flange that will reduce (but not eliminate) the chances of food and liquids spilling between the range and the cabinets. The temperature probe eliminates the guess work out of cooking. 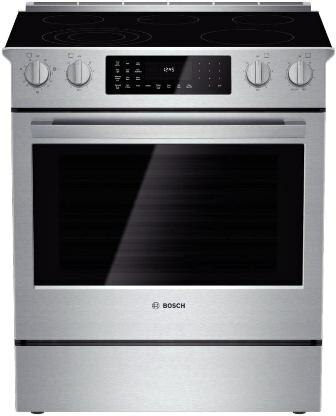 Jenn-Air offers a baking oven versus the warming drawer for the Bosch, so you can cook instead of just warm. The Aqualift cleaning system allows you to clean the oven using only water on a low temperature for 40 minute cleaning cycle versus the 3 hour cycle of most other brands. What I like about Jenn-Air especially is the size. At 6.2 cubic feet, it is 20--30% larger than most brands including Bosch at 4.6 cubic feet. Jenn-Air looks like the better unit with the second oven and a larger size. Bosch, however, is statistically more reliable. Bosch usually has some decent kitchen appliance packages so it really depends. Get The Yale Electric Cooking Buying Guide with features, specs and inside tips to every major brand. Over 100,000 people have read a Yale Guide.